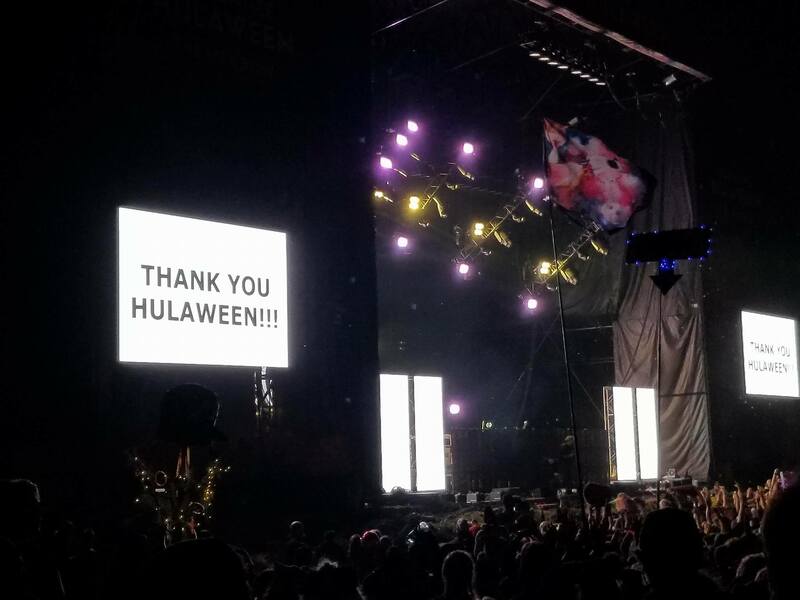 This past Halloweekend, The Spirit of Suwannee Music Park in Live Oak, Florida, came alive again for the third year of The String Cheese Incident’s Hulaween festival. With attendance at over 21,000 the event tripled in size from 2014, forcing campers arriving later than Friday afternoon to set up outside the forest by the entrance to the park. Relatively though these overflow spots were about as far away as a decent camping location at any larger festival. Those of us bracing for a chilly weekend were pleasantly surprised by unseasonably warm weather and mostly clear skies, setting the scene for an absolutely perfect three days of music. Suwannee Hulaween embodies exactly what a music festival should be – an easygoing escape from reality, free of nutty swarms of people there for the wrong reasons and full of loving souls dancing and cherishing amazing music in each others company. Maybe it was the carefully selected lineup of niche jam, jamtronica, and even reggae artists that effected the assembly of such relaxed crowds. It could have been comfortably waking up every morning beneath shady trees to the breathtaking view of Spirit Lake. No matter what resonated most, we all left with unbelievably memories that we’ll surely never forget. So join us in reminiscing on nine of our favorite moments we took with us from the fest. The clever “ghoul train” theme for the weekend was carried out in all it’s glory Saturday in a groovy evening set by The String Cheese Incident, hosted by GZA of Wu-Tang Clan, and joined by the Antibalas Horns, Sheryl Renee, and Leonard Julien. We all boogied down to 70s classics like “September,” “Brick House,” “Car Wash,” and even “Lady Marmalade” in what was an unforgettable night in Suwannee. Afternoon sets ruled Suwannee Hulaween this year, and The Polish Ambassador on Friday afternoon was no exception. Famous for his signature jumpsuit garb on stage, he unzipped to unveil yet a second sparkly bodysuit mid set. The only thing better than one Polish jumpsuit is two, but he sure must have been toasty up there performing in the Florida afternoon heat. Goldfish is the insanely talented duo of Dominic Peters and David Poole who are bringing new jazz to electronic music, and who blew us away Saturday night on the Spirit Lake Stage. Their originally scheduled afternoon set was delayed due to a scheduling conflict, but fortunately not cancelled because their high energy live piano, flute, and trumpet had their eagerly costume-adorned fans dancing the night away. Manamana….there was something so perfect about Papadosio rocking out as the Muppets in the Ampitheatre on Friday. Sticking with the puppet theme recently seen in their new music video for “Epiphany,” Kermit, Beaker, Chef, Animal, and Gonzo treated us with tracks five off their new album Extras In A Movie and impressed with their easygoing, organic rock that made you feel so perfectly right at home in the swamp. After what had already been a wild day of ghoul train shenanigans and “Rivertrancing,” SCI broke into an insane encore of “Signed, Sealed, Delivered” and “We Are Family” that had crowds belting every word, and even singing the tunes long after the end of the set. Even after five sets it goes to show that there is no such thing as too much Cheese, and that these guys will never cease to impress. The Foreign Family Collective breakout producer, Big Wild, took to the Amphitheatre early Friday, dressed in festive ghoul train attire, and prepared to hit an unsuspecting crowd with his adventurous, West Coast beats. His live piano, drumming, and whistling won over plenty of new fans that day, and is certainly a set we’ll never forget getting down to. By day, a cool misting station, but by night these domes Spirit Lake side transformed into a late night sanctuary. Pyrotechnics lit up the two story DJ booth where Atlanta local favorites Ployd and Andy Bruh kept the party going until the wee hours of the morning. It was something about the cinematic styles of ODESZA under the Suwannee Spanish Moss that was absolutely breathtaking. The Amphitheatre pit may have never seen such a packed out, beautiful mess of people all bobbing together and not a face was without a smile.